Life with a toddler is life with a person who experiences everything intensely. To a small person, everything is big. A ditty played by a toy is reason for a full-out, throw-down dance party. Difficulty putting something in a pocket is reason for tears and foot-stomping. A surprise peek around the corner is reason for deep belly laughs. An ant on the sidewalk is reason to stop, crouch, and watch. And a glimpse of someone you love in the morning is reason for huge smiles, huge hugs, giggles. It’s a life of delightful misunderstandings. Confusion about air conditioner/hair conditioner. It’s unique language that evolves and changes daily. Opameal for breakfast, light flashes to illuminate a dark corner, goggies barking, and pretzel yogurt treats. It is evenings of bubble baths with bubble beards, hula-hooping bear pajammys, Goodnight Moon/Great Green Moon, family hugs, and recaps of every detail of this big busy day. Life with a toddler can be frustrating when a request for water becomes tears over the cup the water is in. Or when shoes must be changed three times before leaving – by myself. It is everything magnified. Flower petals. Sad feelings and mad feelings. Specks in the rice. The importance of the small details. But my oh my is life with a two-year-old great. It is snuggles and laughs. It is the perfect-sized little hand reaching for yours. It is the summertime toddler smell of baby sweat and sunblock and dirt and strawberries (this smell is nearly as good as newborn baby head). It is hugs for everyone (and lessons about how not every other little person necessarily wants a hug). It is a song for everything (followed by “you know that song?”, which was just made up moments ago). Dances in the kitchen and ongoing narratives. It is messy morning hair and sleepy hugs. It is stories about elephants and engrossing pretend play, block towers of surprising height and intricacy, pancake parties and backrubs. When Evelyn was an infant, I’d see parents of toddlers and feel absolute fear over that stage. The motion, the willfulness, the negotiation. And there is all of that. And yes, it’s exhausting. But the payoff is great. The bigness of the love, the awe in the everyday, the constant discoveries and developments- as long as we give it space, it adds up to a time of wonder for all of us. I wrote this last week and never posted it. And then our family experienced an unexpected and difficult loss. 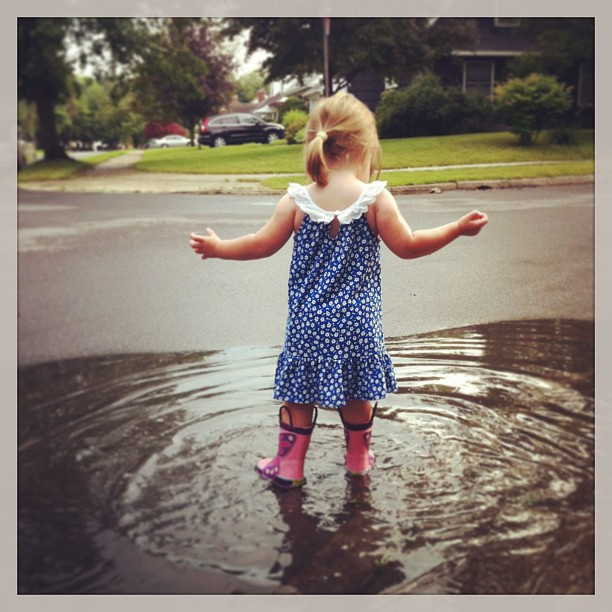 And more than ever I see the beauty in this glorious and intense moment of toddlerhood. In this time of deep sadness and grief, there is nothing quite like the gift of wild hugs and kisses and cuddles and fresh-eyed observations from a 2-year-old. I am so grateful. Truer words have never been spoken. I'm so sorry to hear that you've experienced a loss; I hope that your fond memories are a comfort during a hard time. You're correct on all counts, though. Toddlerhood is frustrating and amazing all at once. Just when I think I am going to go bonkers if my child has one more tantrum in a day, she comes over and gives the most glorious hugs and kisses ever; sometimes they're not even for me… they're for me, or for Daddy, or for her big brother. A toddler won't hug if she doesn't feel like hugging, so you know that when she does, she's hugging with every fiber of her loving soul. Seeing a child love all creatures great and small, thrilled by the ant on the sidewalk as much as she is by the puppy next door, is remarkable. If only the wide-eyed innocence would last forever. Saving this to read on a regular basis! Particularly will be useful for those more *trying* times when I need a reminder and help to change my focus.